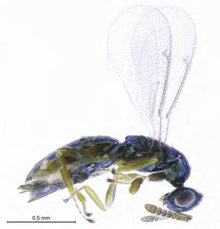 Egg parasitoids of beetles (Chrysomelidae) and wasps (Diprionidae), or larval parasitoids of flies (Agromyzidae). Crawford, J.C. 1913. 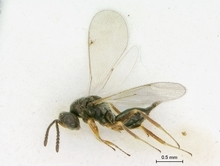 Descriptions of new Hymenoptera, no 6. Proceedings of the United States National Museum 45: 241-260. Förster, A. 1841. Beiträge zur monographie der Pteromalinen Nees. 1 Heft: 46pp, 1 plate. Aachen. Gumovsky, A. 2016. 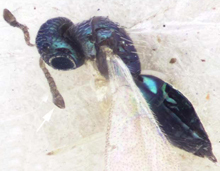 A review of genera and described Afrotropical species of Tetracampinae (Hymenoptera: Tetracampidae), with description of a new genus from East Central Africa. Zootaxa 4111: 393-420. Haliday, A.H. 1844. 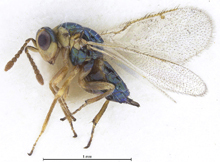 Contributions towards the classification of the Chalcididae. Transactions of the Entomological Society of London 3: 295-301. © Alex Gumovsky (Schmalhausen Institute of Zoology, Ukraine).